Ever get baffled or confused about insurance marketing? It’s different than it used to be. That’s because people are different than they used to be. More precisely, their behavior is. Their psychology is the same. But a lot of what they do is very different. Like the way they read. That way they research. The way they interact. And the way to shop. The insurtech world is flooding our world with new competitors. Insurance agents and brokers must learn everything they can about their customers. After all, these insurtech competitors want your customers. and they have a lot of money riding on it. They’re online. You must be, too. By now, most have the what’s equal to a ‘master’s degree in being online.’ Many would qualify for a Ph.D. Insurance agents must be at least their equal! They use mobile. As you can see from the stats above, they use it a lot. That means two things. Your website must be ‘mobile’ – or what’s known as responsive design. On top of that, if you use a marketing automation service, make sure that your emails are responsive. They’re smart. Don’t BS them. Don’t try to trick them. Millennials aren’t the only ones demanding ‘transparency’ and ‘authenticity.’ Everyone got the message from the Nigerian prince. Everyone got the barrage of ‘fake news’ during the election. (Both sides!) Insurance is a trust business. Be trustworthy. But, you may ask, what are the easiest ways to reach them? What is working? First of all, ‘going digital’ doesn’t mean that you stop living in the physical world! If your insurance clients or prospects go to a conference or a trade show, you probably should, too. But – as the stats above show – you can reach them 24 hours a day. Online. What are the best ways to do it? Blog. It’s work. You don’t want to do it. But, let’s remember: work is what we do. Work is what separates the winners from the losers. And smart work is the best. That alone should be enough to motivate you. But, most agents have heard it. And they still don’t do it. Blogging is good for SEO. It gets you more traffic. And, if you say something useful, interesting or valuable, it gets you more attention, trust and loyalty. Downloadable content. On this page, you’ll see something you can download now – and get value from. Why do we do that? Again, attention, trust, loyalty. Just like blogging, a lot of agents go screaming from the room when I suggest they actually write something. It’s not that hard. You can outline and hire a writer. You can talk into a microphone and hire a writer. Or you can write it yourself. You have expertise that the world wants. Share it. You’ve probably heard that ‘content is king.’ Here’s a chart that shows how much more people are searching for ‘content marketing’ on Google since 2004. 2-way engagement. Anytime you can encourage your customers to do something – even the smallest action – do it. Why? Because even small actions – taken in your direction – increase the sense of relationship, trust and perceived value. Send them an email. Offer a free report. Ask them to ‘click a button’ to get it. Ask them to complete a form on your website. Ask them to download content from your site. Ask them to hit ‘reply’ and share their thoughts on something. Remember, relationships should feel like they go both ways. Give your clients and prospects the chance to move your direction. A click is all it takes. Be mobile. Make sure your website is mobile-ready. How do you do that? Look up your agency’s site on your smartphone. If it doesn’t automatically adjust – so it’s easy to read, scroll and navigate – fix it. Immediately. Likewise, your emails must be responsive. Remember the free report offer? Here’s what the bottom of that message looks like on a desktop. And on a phone. Notice how it automatically adjusts the columns for mobile? Run a Reviews Campaign. It’s crucial. Whether you’re on social media or delivering an email to your clients, make sure that most of what you say is about them. Not about you. Use digital media the right way. Organize it into three buckets. Social media is good to expand your reach. It’s also good to engage your customers and prospects. Marketers groan about the difficulty of measuring ROI with social. But it’s a necessary part of the insurance marketing tool kit. Your website is good to generate leads. It’s also good to engage customers and prospects. But, don’t think you can ‘launch and leave alone.’ You’ll get out of it what you put into it. Your marketing automation system. This is the ROI-maker. 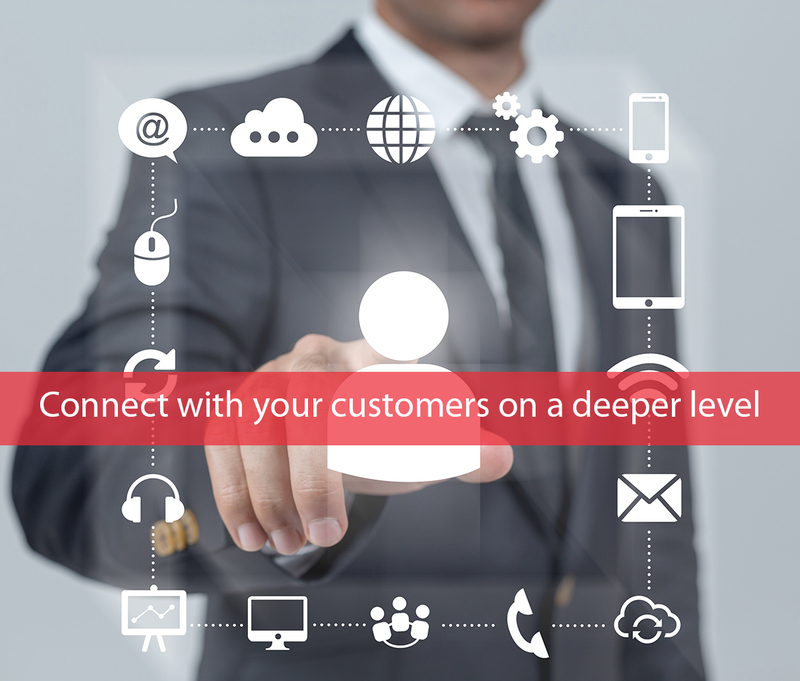 High quality marketing automation makes it easy to automate personalized and customized communications. Make sure you use a system that integrates with your agency or broker management system. That way, messages will automatically be ‘triggered’ – while your customers are guided through their customer journey. Share your ‘community engagement.‘ Millennials have set the bar high for companies to ‘make a difference.‘ Historically, that’s been a strength of the agent-broker channel. If you’re active in your community, tell the story – on social and on your website. (If you can’t update your website ‘in-office,’ you either need to demand that from your vendor, or get a new vendor. Digital marketing isn’t just ‘advertising.’ You probably advertise to get new customers. But, the big money happens after you get a customer. Guide their customer journey with personalized messaging that delivers the right message to the right person at the right time. Boost retention. Get more policies per customer. And get more referrals. Insurance agents and brokers who want to market to the modern consumer needs to catch up fast. The direct channel – like GEICO or Progressive Direct – is good at it. In fact, they are masters. The emerging digital channel will be very, very good at it. And, they do want our customers. Like anything else, you’ll get out of digital marketing what you put into digital marketing. It may seem confusing, but it doesn’t have to be. The internet removed the barrier between you and the marketplace. Now is the time to say something that matters. And do it frequently. They don’t want you to jump online and sell. That will turn them off. But you can jump online and prove that you’re trustworthy. You can prove you have expertise. You can prove you care. I presented 9 top ways to connect with the modern consumer. You don’t have to master all nine. Master one or two. Then move on. Blog more. Traffic will go up. And you’ll convince more people to trust you. Engage your marketplace. It’s a powerful psychological tool. Get them to click, download, fill out surveys, forms or ‘hit reply.’ Strong relationships are two-way, not one-way. Check your website and your email service. Are you mobile? This is a must do. Immediately. Always deliver value. Give, give, give. Don’t just take, take, take. If you try, they won’t give! Get more online reviews. They convince people to follow you, investigate you, and, ultimately, to do business with you. Organize your online world. Think ‘social’ for engagement and new lead generation. Think ‘website’ for lead gen and engagement, too. Think ‘marketing automation’ for deeper relationships – and strong business metrics in higher retention, policy count and referrals. Tell the world you care about your community. And what you’re doing about it. People want to know you make a difference. Guide your customer journey. Don’t ignore them once they become a customer. Use marketing automation to ‘trigger’ messages as they move through their lifecycle with you. Agree? What else do you do to connect with today’s insurance consumer? Get a copy of my new guide to insurance marketing here: www.michaeljans.com.